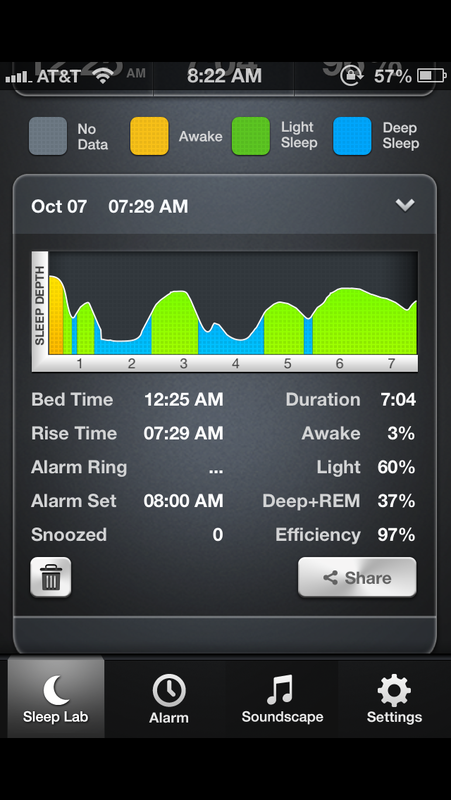 Holy crap, I gotta download Sleeptime! I used my fitbit to monitor my sleep and it was very enlightening–but it didn’t have the ability to differentiate my REM from light sleep! okay. how do i USE sleeptime? i downloaded it and the screen just says “info” (which gives me pretty much nothing) and “5 min” and “10 min” buttons. and an option to change the background. isn’t it sort of an alarm clock that is supposed to wake me up? where are the instructions? argh. i want to use this. ZOMG did you know there is another app called Sleep Time? (the one I described). And it costs money. And I have NO idea what it does. But I just found the right one! woohoo! too much in my brain is indeed keeping me awake! I downloaded SleepTime the other days after I saw you talking about it on Twitter. I, unfortunately, have always had problems with sleeping. I have trouble falling asleep, and staying asleep, and even when I seem to get plenty of sleep, I’m still groggy and listless. Ugh! While I admit that this weekend wasn’t really the best test, as I had a sick toddler and was up a good bit anyway, it was interesting to see my sleep patterns. I had no idea I was waking up so many times! And my REM sleep periods seem very short. The highest efficiency I’ve gotten is 82%. I don’t know if that’s good or not. While I like the app, and it’s a great learning tool, it would be nice to have a few more bells and whistles, like more information on what happens during the sleep cycles, how to improve the quality of our sleep, etc. Thanks for checking the app out! In terms of content, we like to post articles regarding sleep efficiency and effectiveness on our Facebook Page (https://www.facebook.com/azumioinc), or on our blog (www.azumio.com/news). As a matter of fact, our last posting on the Azumio blog was about how to get more efficient sleep, so you might like to check that out! I just tried this for the first time last night and am kind of fascinated with it! Will be interesting to try it out a little bit as last night was a bit of an anomaly where I had a really great night of sleep. I’m a chronic insomniac. Ok. I tried the free version of Sleep Time and I love it. I literally woke up in an amazing mood because of that app (bc it’s been a weird 24 hours otherwise). I was astounded at how it helped me change time zones ESP West-East!